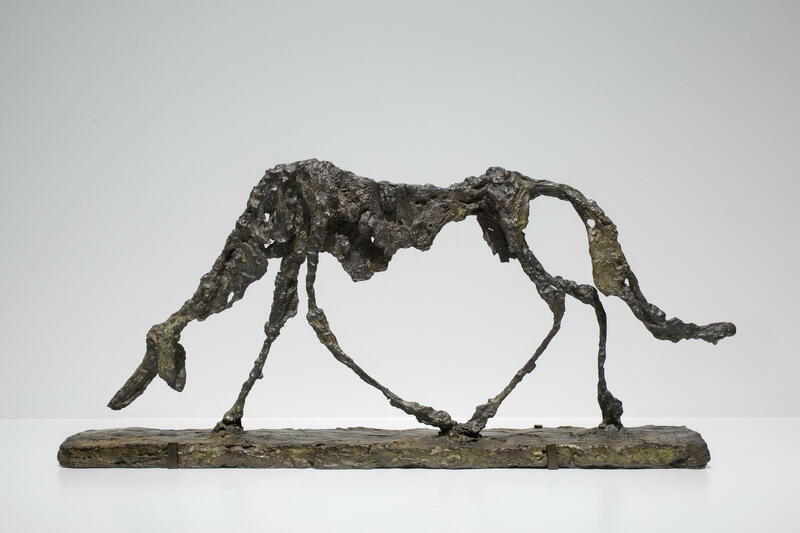 Alberto Giacometti didn't sculpt heroes on horseback; he depicted everyday humans — and animals — struggling to get through the day. Above, his 1951 bronze sculpture Dog (Le chien). 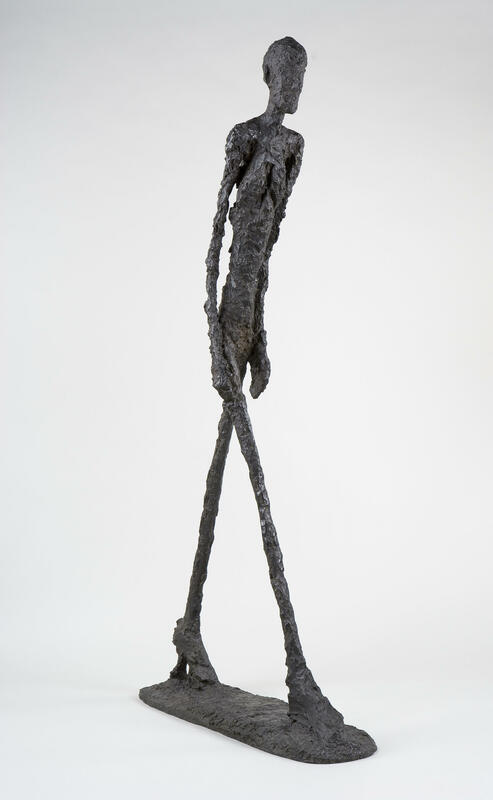 Giacometti's impossibly thin bronze bodies stride like shadows. Above, his 1960 sculpture Walking Man I (Homme qui marche I). Giacometti paints in his Paris studio in 1958. 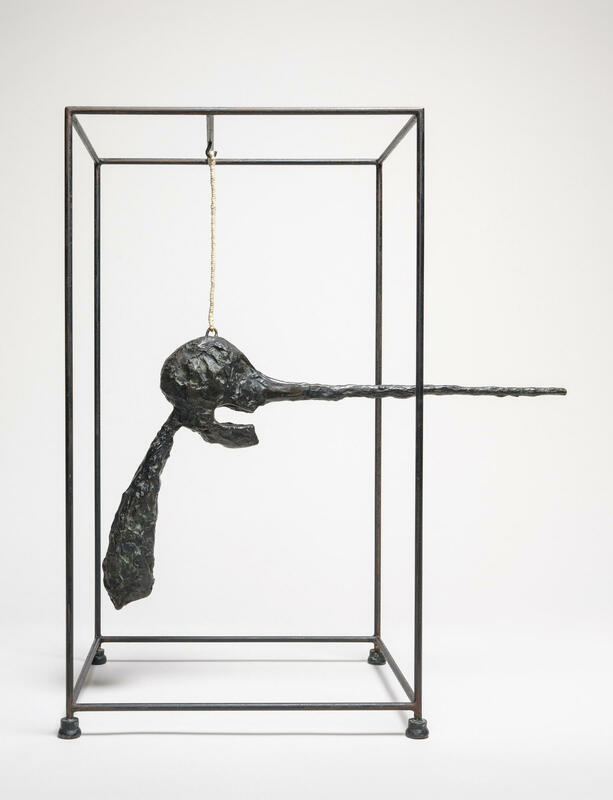 Giacometti created The Nose (Le nez) in 1949 out of bronze, wire, rope and steel. In the film, Giacometti (Rush) tells Lord (Armie Hammer) that he's always doubted himself. Lord doesn't understand — and points out that the artist gets more successful every year. Giacometti replies that there's no better breeding ground for doubt than success. "There's torment in every one of us," Tucci says. "Giacometti wasn't afraid of displaying it." At the Guggenheim, Catherine Grenier, Director of the Annette and Alberto Giacometti Foundation in Paris, says the painter-sculptor's small Paris studio was full of unfinished works — sculptures of elongated, super-slim, vulnerable-looking men and women. Their sculpted surfaces are knobby; they've been pulled and pushed, parts of the clay ones pinched off, re-shaped, stuck back. "It's like he was struggling with the sculpture," Grenier says. And what's distinctive about him is that he wasn't creating generals on horseback or Greek gods — nothing heroic. Instead, he represented ordinary human beings slogging through their days: He shaped them, changed them, shaped them again. "You can see his fingerprints in the clay ... like scars," Grenier says. "There is a lot of violence in his work." Giacometti's obsessive changes often led to disaster. The clay figures became so thin, through all the changes, that they fell apart. Some pieces were destroyed, not because he wanted to destroy them, Grenier explains, but they broke as he reworked them over and over again. As he worked, Giacometti was frustrated that he couldn't achieve what he wanted to create. Stanley Tucci finds resonance with his own work as an actor-writer-director. He says creative people are always questioning why they do what they do, how they do it, and how they can continue doing it well. Guggenheim curator Megan Fontanella believes there's something universal in Giacometti's obsessive process. "I think everyone can identify with his kind of struggle," he says. "And this ambition he had to start again and persevere." Grenier agrees, and finds something heroic in the persistence: "He made something positive of this idea of failing, of difficulties, of starting again every day," she says. "Starting anew every day." His was an admirable struggle. Alberto Giacometti made drawings and paintings and sculptures. The sculptures are what he's best-known for, these long, skinny bronze bodies striding through life like shadows. Today New York's Guggenheim Museum opens a big show of his work. And NPR special correspondent Susan Stamberg tells us that the show plus a recent movie give Giacometti his moment. SUSAN STAMBERG, BYLINE: If you like zaftig, Giacometti is not your man. If you like confidence, he's not there either. ARMIE HAMMER: (As James Lord) Have you always been like this? GEOFFREY RUSH: (As Alberto Giacometti) Like what? HAMMER: (As James Lord) So doubtful of your own ability. RUSH: (As Alberto Giacometti) Of course. STAMBERG: The film "Final Portrait" shows Giacometti in 1964, agonizing over a painting he's doing of American writer James Lord. RUSH: (As Alberto Giacometti) It gets worse every year. HAMMER: (As James Lord) But you become more successful every year. STAMBERG: What's a better breeding ground for doubt than success? - Giacometti mutters. RUSH: (As Alberto Giacometti) Don't smile. HAMMER: (As James Lord) Well, you did. RUSH: (As Alberto Giacometti) No, I didn't. HAMMER: (As James Lord) You did. RUSH: (As Alberto Giacometti) I did not smile. STAMBERG: Geoffrey Rush plays the prickly Italian-Swiss artist to a shuffling, smoking, obsessive fare-thee-well. The film was written and directed by Stanley Tucci, based on James Lord's eyewitness account of the artist at work. Tucci says Giacometti's agony is universal. STANLEY TUCCI: There's torment in every one of us. Giacometti wasn't afraid of displaying it. STAMBERG: Whenever I feel most hopeful, Giacometti once said, that's when I give up. 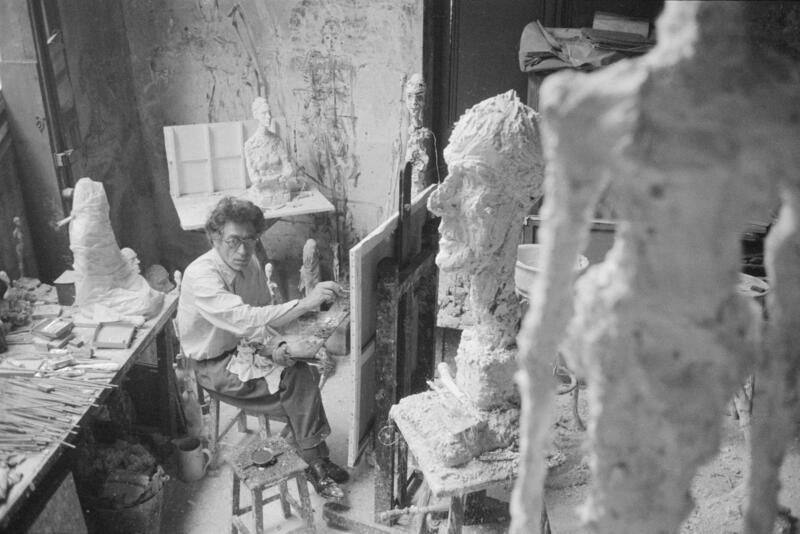 Catherine Grenier of the Giacometti Foundation in Paris says his small Paris studio was full of unfinished works, pieces produced after the trauma of World War II, made of clay, plaster, bronze - elongated, super slim, vulnerable-looking men and women, their surfaces knobby, pulled and pushed at, changed obsessively. CATHERINE GRENIER: It's like if he was struggling with the sculpture. And what he's doing, which is different from the other sculptors, is that man - the humankind that he is representing is not made of heroes. STAMBERG: No heroes, no generals on horseback, no Greek gods - ordinary people, wrenched apart and reconstructed by a sculptor waging manic hand-to-hand combat with his vision. GRENIER: You can see his fingerprints in the clay. And even in the bronze, you can see, like, scars, as there is a part of violence in his work (ph). STAMBERG: Sometimes, this struggle led to disaster. The clay figures got so thin, they fell apart. GRENIER: Very often, he has destroyed his sculpture, not because he wanted to destroy them but only by working and reworking and reworking. can't stop. RUSH: (As Alberto Giacometti) We can't stop. I have to stop. HAMMER: (As James Lord) It looks really good. What'd you do? RUSH: (As Alberto Giacometti) I have no idea. STAMBERG: In "Final Portrait," Giacometti reaches a magnificent point in his portrait of James Lord. And then he paints on top of it over and over until Lord's head seems wrapped in white bandages, as if Giacometti had killed him. The film's writer-director Stanley Tucci shows the struggle going on and on. TUCCI: We find him, you know, on Day 3, on Day 5, on Day 6, on Day 10, finally Day 18, and this thing is never-ending. He's constantly deconstructing or undoing what he has done again and again and again because he wasn't finding what he wanted. He wasn't finding he was able to achieve what he wanted. STAMBERG: Like so many creative people, actor-director-writer Tucci finds resonance here with his own work. TUCCI: You're constantly sort of questioning - why do I do what I do? And then, how do I do what I do? And how do I do it well? And how do I keep continuing to do it well? STAMBERG: Guggenheim curator Megan Fontanella says that perpetual questioning is part of the human condition. MEGAN FONTANELLA: I think everyone can identify with this kind of struggle and this ambition that he had to start again and persevere. STAMBERG: Giacometti Foundation director Catherine Grenier finds something heroic in this persistence. GRENIER: He made something positive of this idea of failing, of difficulties, of starting again every day and starting anew every day. STAMBERG: Alberto Giacometti is considered one of the giants of 20th-century art. His creative struggles give humanity a slender chance and hope.